I went to Kwong Shin Optical on Sunday afternoon and the whole place was packed. Something must be going on at the GuangYin Temple nearby as there were many many people. 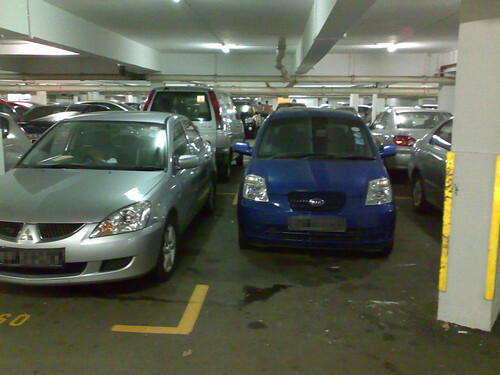 Sim Lim Square and Burlington Square's respective car parks were also full too. It was one of those days where one car goes in and the gantry says "Car Park Full". Wait a couple of minutes, some other car will exit from the car park before the next car in waiting is allowed to go in. Guess what? The gantry says "Car Park Full" again. Rinse, repeat. So what that means is that when you get in, there is only ONE lot available in the entire car park for you and it's the one left by the previous outgoing car. Question is, where the hell did that car park previously? And so I wandered my way around the car park aimlessly looking for that ONE lot. Now this is in Bras Basah Complex which is a very old building. None of the fancy green/red light indicators above every lot to help you locate the empty lot easily. It took me a while to find the lot before I proceeded to reverse into it. "Hmm..... why today parking a bit more tricky ah? How come this pillar (on the car's left) position different from the rest of the pillars one? Nabeh... this spot very tight leh....."
But I still managed to park it in. "... EH? HOW COME MY PARKING LOT IN FRONT NO HAVE THE YELLOW LINES AND LOT NUMBER ONE????!!!" Gotta love them small cars. You got tio fine bo? which means still got one more lot right? "gotta thank vandalin for the small car." That's why I loved my little black Getz. Was really sad to see him go when we left for Hong Kong. Anyway, you made it to church this time? When u mentioned Kwong Shin and Sunday. I was like wondering WTF I thought they not opened??? Ahtiong73: The only things missing are 1) fuel efficiency, 2) acceleration and 3) boot space. I guess you get what you pay for. ruok: Yes, there should still be one more lot which I can't be arsed to go look for it. msvindicta: Yeah, you must've read the first draft coz I edited that out in the final copy. Faith: No. I took a break. barffie: then you go squeeze one of those crevices, take picture then blog lor. Hooray to city cars! Big cars take up all the space in this space-limited city! Yes indeed. Cars of today are definitely much bigger than their predecessors e.g. Honda Civic, Accord, Toyota Corolla etc. I remember when I was in southern France in 2006 and was walking along this one particular cobble street. The side of the road was lined with cars parallel parked and there was this one spot where there was a gap of about only half a car length. There was a SMART car parked snugly inside.